How does Camera Sensor Size Impact Photography and Cinematography? Every camera has a sensor, and one of the biggest differentiators between cameras is the physical size of the sensor. Which size is best? Are there any sizes you need to avoid? Length of the sensor (in mm) x Breadth of the sensor (in mm). The reason it’s in millimeters is because the sensors are small, and the number in millimeters is easier to remember. Nothing fancy. Is there a standard sensor size? The most expensive DSLRs and mirrorless cameras from Canon, Nikon, Sony, Leica and Pentax have sensors in this size. 35mm film (for photography) was (and is) the same size. This is why I use this size to calculate my crop factors and the 35mm equivalent. Super 35mm. The length is 24.89mm. It can vary depending on the aspect ratio (click to learn more). Cinema has two ‘popular’ aspect ratios: 1.85:1 and 2.39:1 (Widescreen). Depending on this the height can change. I’m overwhelmed! Which is the best? I know, if you’re a newcomer you’ll have no clue. It’s my word against the rest at this point. If you really want to know the truth you’ll have to get your hands dirty and get technical. At the same resolution Better the Worse the What’s different? Larger the sensor Light collecting ability (low light ability), shallow depth of field Price, lens size Due to changes in sensor size, lens size and other phenomena, you won’t get the exact same image in practice. Each sensor-lens combination has a unique look. Each sensor-size and lens combination has its own look. It’s not ‘better’ or ‘worse’, but different. Aesthetically different. In short, pick a sensor like you would pick a paint brush…or a toothbrush. Hey then! Why do people keep praising large sensor cameras? Well, camera manufacturers know how to milk that to create uncertainty. 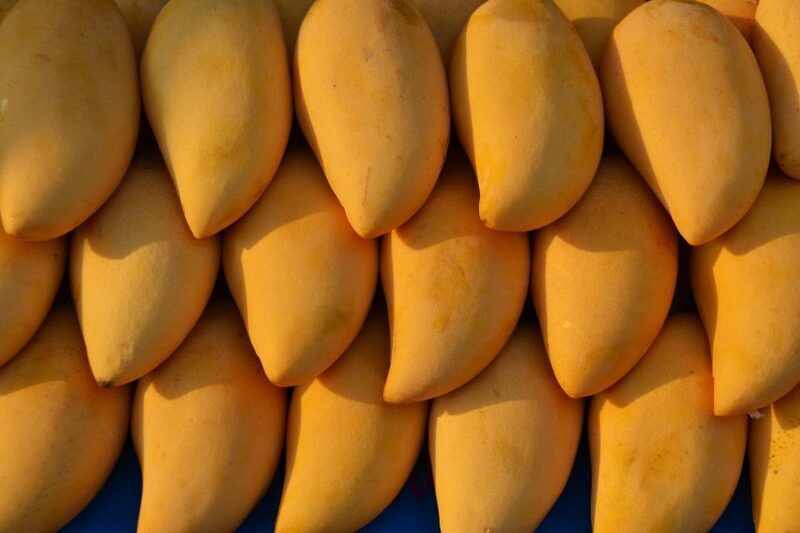 Let’s say you go to the market to buy mangoes. There are two boxes, one with small mangoes and next to it another box with bigger mangoes. Do bigger mangoes always taste better than the smaller mangoes? You and I know that’s not the case. Small mangoes can taste great too. But the uncertainty here is (especially for newcomers) – does the size have anything to do with it? You can add various elements to make it even more confusing – change the quality of the box, mangoes are of a different color, one bunch of mangoes have a hologram sticker, the bigger size is from an exotic country, and so on. Soon, you won’t know why the higher-priced mangoes are higher-priced. Because of the popularity of mangoes, we know the most important criterion is taste. But replace mangoes with some other unknown fruit or vegetable or camera-sensor you’ve never heard of before. Now you see, don’t you? Now, when you compare the specifications of large-sensor DSLRs to small-sensor DSLRs from the same manufacturer, you’ll see the manufacturer cleverly neglects to add features found in the more expensive camera to the smaller-sensor camera. You have to ask yourself: Why don’t they keep the features the same? If the sensor-size was so obviously important, surely they don’t have to omit their cutting edge technology features like weather protection, faster autofocus, better viewfinder, and so on. They want you to associate image quality with sensor size, when it isn’t. They hope you won’t notice. Therefore, when you buy big-sensor cameras, you’re not only paying extra for the bigger sensor, but also for additional features in the camera. Which sensor should I buy? Here’s the best answer to that question: Don’t bother about the sensor! If yes, then buy it, and learn to shoot great photographs or videos with it. If you’ve been following news you’ll know people shoot movies even with GoPros and iPhones these days, so stop chasing large sensor cameras with your wallet. It’s not going to make you a better photographer or cinematographer. It’s not going to make your film any better, and it’s not going to make you famous. Point your expensive camera at crap if you want to, but it won’t make crap look expensive. An expensive camera will surely empty your wallet, but won’t guarantee production values. Then isn’t it better to spend your money on what will guarantee production values? Things like better actors or models, better sets and wardrobe, traveling, extra hands, and so on? I hope this simple explanation of sensor sizes has helped you understand it on a gut-level. That was all I intended to accomplish. If you feel it has helped, please let me know!